NPR has a poll up on their website asking folks to vote on the best young adult fiction. The poll isn’t perfect. Some books I’d consider a series (such as Robin McKinley’s The Blue Sword and The Hero and the Crown) are listed separately, while others are lumped together as a whole (The Princess Diary books, for instance). Some books they left out because they’re aimed too young, but that seems inconsistent (I assume that’s why Little Women isn’t included, but Anne of Green Gables is). The same is true with adult books that have become YA staples. However, for all its flaws, how often are we asked, rather than told, what the best of the best is? Regardless of whether you prefer stand-alones or series, modern or classic, I guarantee you will find some of your favorites on the list. I had to force myself to pass over books I like quite a bit in order to pick only the creme de la creme — the very best of the books I’ve read and re-read and hand-carry with me when I move, the ones that I routinely give as gifts, the titles that create a bond between me and another person just because we both love them. Sometimes I feel the need to do unexpected things. Generally, these surprising things are just off-beat, but sometimes they get a little wild. 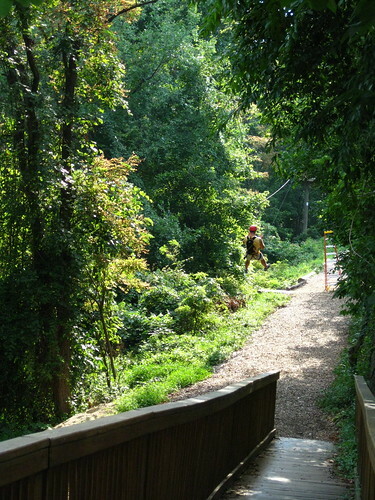 Like on Sunday, when I headed up to Savage, Maryland, to do a ropes course — on my own. 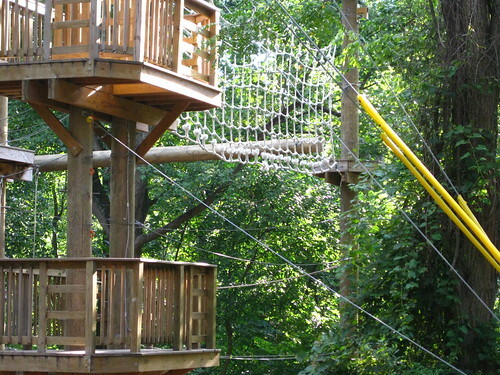 If you’re wondering what a ropes course is, think Outward Bound. Think awkward team building exercises on sitcoms. Think slightly nuts three stories in the air. Essentially, you put on a helmet and a harness and then you climb up to these platforms and then walk across a variety of ropes/cables/logs/seemingly insubstantial items to the next one. Eighteen times. Or, if you’re me, you do the first level fine, and then the second level okay, right up until you get to the final crossing on that level — the ship rigging part. It will be at this point (or, rather, halfway across it) when you realize that you did not eat breakfast or lunch before heading out on this crazy adventure (because you were running late) and you’re feeling a little light-headed because it’s sunny and humid and 90 degrees outside, and, gosh, you should really have worked on upper-body strength exercises, because this is a lot of work, and maybe you should wrap your arms around the ropes, because you aren’t all that sure you aren’t going to fall (or, at least, dangle from your safety harness and force someone to come rescue you). I did not fall. I did tell the girl running that section of the course that I needed to rest, and clearly I looked like I was going to pass out, because she suggested rather urgently that she’d like me to do that from inside the platform, rather than draped over the top of it like I was when I said it. Realizing that food was in order, I became possibly the first person in the history of ropes courses to pause during the process for a tea break. Refreshed, I returned to the course, and climbed back up to the third level to finish it off. I ran into a few problems on this top section, such as where I picked the wrong rope to walk on and had to switch to a different one halfway across the biggest drop. Also, the top level shakes quite a bit, which is disconcerting, even though intellectually you understand what’s happening and why you’re safe. Next up was the giant swing, where you get winched 40 feet up into the air and then the winch lets go and you slingshot dooooooooowwwwwwwwwwwwn and foooorrrrwaaaaaaaaaaaaaard before you head back uuuuuuuuuuupppppppppp. This was fun, except that I had to pull the cord that disconnects the swing from the winch, and I was not expecting how long it takes to grab back onto the bar with that hand. I don’t think I screamed, but, honestly, I couldn’t swear that I didn’t. And, finally, on to the zip line. You have to cross another cable to get there, but this one is only 15 feet off the ground. My apologies for all the deserted pictures. By the time I finished, the zipline was the only thing still running, and they discouraged you from taking a camera out on the course with you (for fear you’ll drop it), so I had to wait to snap shots until I got back to the car. And anyway, since I was by myself, you wouldn’t have recognized anyone in the shots anyway. I don’t know that I feel any more self-confident (a claimed side effect), although I suppose I am proud of myself for heading back out after I ate, when it would have been easy to skip the top level. 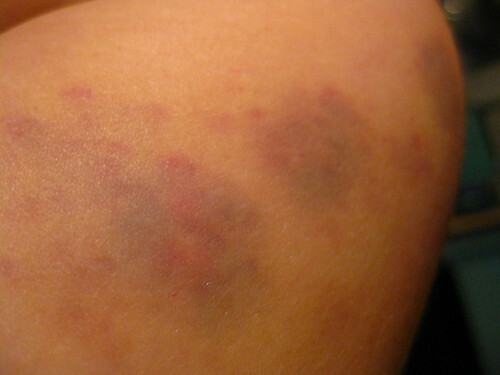 And I do have this rather fetching set of bruises (and lots and lots of aches today) on the inside of my arm from where I hugged that rigging. 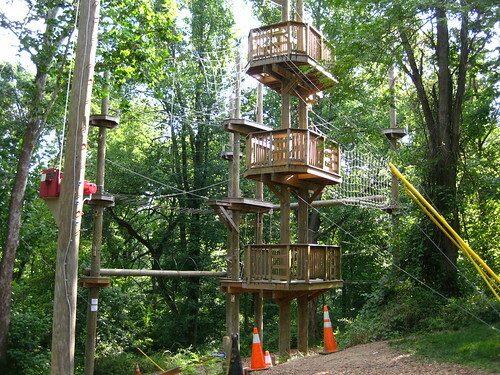 I’m not ruling out doing a ropes course again, but I probably wouldn’t bother doing it by myself again. It seems like people who had a buddy with them were enjoying themselves a lot more than I was. Also, don’t skip meals before you go, no matter how late you are running! Finally, I leave you with this video. 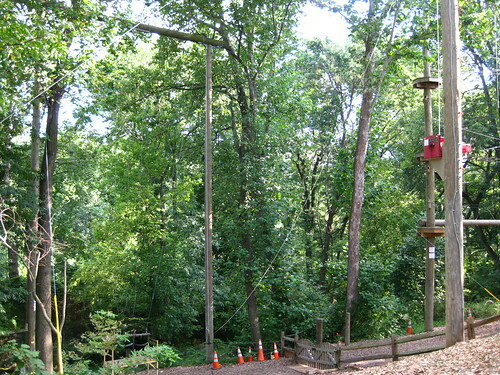 It has nothing to do with me, except you can see the swing in action and some of the high ropes course I did. I decided on the yarns for my Color Affection, drawing somewhat on a suggestion from my mother. She thought reds and oranges, like in a sunset, would fit the bright color combination I was looking for. Rudi and I pulled out a bunch of my yarns tonight and decided on three. One is a merino-nylon blend in a cranberry color, one a merino-tencel blend in wild rose (a cheerily bright pink that borders on neon), and the third a merino-mulberry silk blend in a purple that a bunch of online vendors refer to as Italian plum. I apparently cannot, however, follow a simple pattern while watching an engrossing performance like the Opening Ceremony, because I screwed up the pattern in the third row and continued merrily and wrongly along for the first inch or so. Also turns out that I correctly suspected that the needle called for wouldn’t give me gauge. That’s not usually a problem when you’re knitting something like a shawl, but, in my case, it would have meant I ended up with a smaller wrap than I was hoping for. So messing up so early on turns out to be a blessing. I look forward to casting back on tomorrow with a needle one size up to see if that’s enough to fix it. I hope it will be, but I’ll measure early to verify. We’ll consider this our first heat — not placing first, but enough to carry on. Category: knitting. There is/are Comments Off on ravelympics progress: opening ceremony. 1. Homemade (by me!) chocolate chip ice cream on a night when it was still nearly 95 degrees at 11 p.m.
2. Susan invites me to have dinner with her and Holden. She then allows me the honor of reading the bedtime story. Being the adults, she and I get to stay up and chat after it’s lights-out for Holden. 3. Riding home from Rosslyn after my volleyball game, I cross the Key Bridge just as the sun is tumbling down behind the trees upstream. The spires of Georgetown before me catch the last evening rays, and the Potomac River below is calm beneath the oars of the scullers heading back to the boathouse. As you know, the Olympics begin on Friday, which means that I have slightly less than 48 hours to figure out my knitting project to work on during the Games. As with every Olympics since 2006, knitters, crocheters, weavers, and spinners around the world will begin a new project or pick up a long-lingering one with the intention of completing it before the torch is extinguished at the end of the closing ceremony. The first time this massive knit-along was conducted it was known as the Knitting Olympics — a brainchild of the Yarn Harlot. In 2008 and 2010, the field of play expanded to include crochet and moved to Ravelry, where we dubbed it the Ravelympics. This year, due to a cease-and-desist order from the U.S. Olympic Committee (accompanied by a poorly thought out letter that ended up eliciting a slew of bad press before an apology was issued for the wording), the knit-along once again has changed names. We have henceforth dubbed it the Ravellenic Games. I already have the project I’m going to work on picked out. I’m going to knit a Color Affection shawl. What hasn’t been decided is what colors to make it with. I’d like to use up some of the yarn I already have on hand, as it calls for three skeins of sock weight yarn, and, frankly, I have a lot of sock weight yarn. My solid/semi-solid choices are decidedly more restricted than would be my variegated options, but I think I like the way a one-color yarn works more than a multi-colored one in this instance. And I’m not above a trip to the yarn store to supplement the stash, but I’d like to rule out what’s at home first. Normally I’d go for three bright colors — probably blue, green, and purple — but the completed shawls on Ravelry [apologies if you can’t access that link] suggest that picking at least one neutral/dark might make for a more striking accessory. Unsurprisingly, neutrals are few and far between in my stash (and life), so if I go that route, I’ll likely need to hit the store. So, if it were you making/buying this shawl, what colors would you pick? Leave a note in the comments to help a girl out. Category: knitting,sports. There is/are 5 Comments. Jeffrey’s parents died in a trolley accident when he was a baby, so he was sent to live with his aunt and uncle, who, unfortunately, couldn’t stand each other. They refused to speak to one another and found they could make that work by dividing the house into two and splitting Jeffrey’s time between them. But such an environment is not one for raising a healthy, happy boy, and eventually Jeffrey cracks and literally runs away. He turns up a year later in the town of Two Mills, skinny and hungry and in shoes that are falling apart. The first person he encounters is Amanda, who is lugging her complete collection of books to school. After much convincing, she agrees to lend him a book to read. He also runs into a couple of other kids, including John McNab, who is striking out kid after kid until Jeffrey shows up. When the encounter turns sour, Jeffrey takes off running — and runs right across the tracks and straight into more trouble — this time with a boy called Mars Bar Thompson. The two sides of the town may not agree on much, but they share a belief that Jeffrey is a little nuts, dubbing him “Maniac” Magee. Jeffrey does a great many things with grace and elegance — from running to knot detangling to child minding — but interacting with his peers (with the exception of Amanda) is a challenge for him, as is picking up clues about how his disregard for color barriers puts a great many people on edge. When the message finally does hit home, Jeffrey takes off running yet again. Will Amanda Beale and her family, two rival teenage boys, and a groundskeeper named Grayson be able to convince him to stop? Set in what I’d guess to be the late 1970s, Maniac Magee gives us the story behind the folklore of a boy who helped to unite a town. It is sweet and more than a little bittersweet and I highly recommend it.